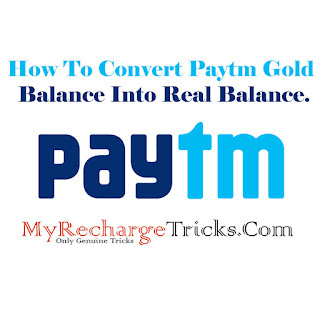 Home / PAYTM / TECH TRICKS / How To Convert Paytm Gold Balance Into Real Balance. How To Convert Paytm Gold Balance Into Real Balance. Convert Paytm Gold Balance Into Real Balance:From Today Onwards Paytm Will Give You Gold Back Instead Of Real Cashback If You Have Not Done Your KYC. Gold Balance will be given to you Instead of Real Balance. You Can sale your Gold Balance But You Have To pay 3% as a Fee. So Hurry And Do Your Kyc Verify With Paytm. Hey! Welcome to MyRechargeTricks.Com Hope You All Are Enjoying Our Free Recharge Tricks, Shopping Deals, Coupons, Recharge Loots And Many More. Today We Are Sharing The Way You Can Convert Your Paytm Gold To Cash Balance. Hope You Enjoy It. Follow These Steps To Convert Your Paytm Gold Balance Into Real Balance. If You are Transaction on Paytm With a Minimum KYC account from now Paytm will give you Gold Balance instead of Cashback. Now select the gold amount you want to sell. You will be charged 3%. Add your Bank Account Details where you want to receive Amount. Your Money will be added to your bank account within 24 hours. Hope You Enjoyed The Above Tutorial. For Instant Deals, Alert Join Our Telegram Channel and Like Our Facebook Page.